This play is Carlo Gozzi’s 1760s version of a Persian fairy tale, in which a stunningly beautiful and clever princess of China refuses to wed and orders the beheading of any suitors who fail to correctly answer her three riddles. Knowing nothing about China, I decided to approach this project with place and period accuracy in mind. This led me to the contemporaneous Qing dynasty and all of its elaborate court dress, which evolved into the distorted, mythical world of my Turandot. 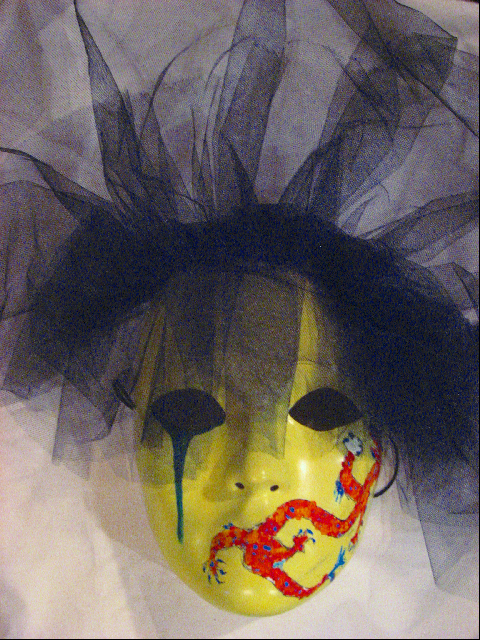 The mask photographed here, representing Turandot, was also part of the assignment. While I initially struggled to break into the play visually, the process of designing the mask provided a new approach which greatly informed my final design choices.